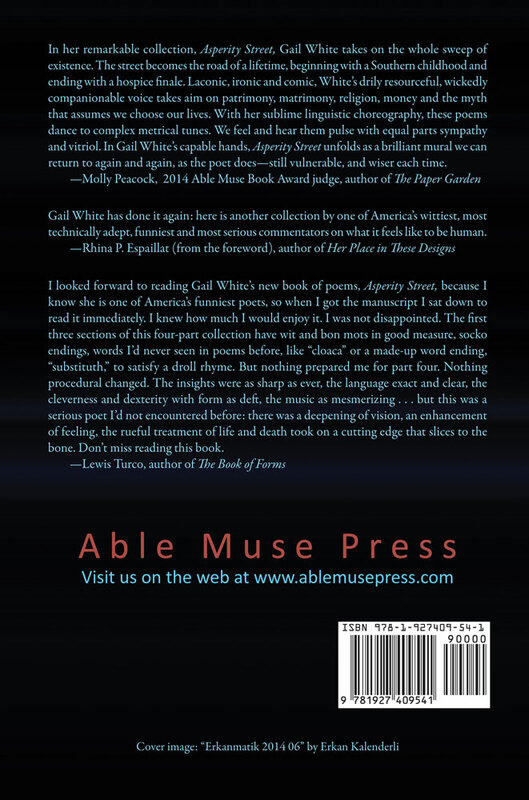 Asperity Street, Gail White’s most balanced poetry collection, explores the breadth of human existence with cutting wit, irreverence, keen intelligence, and an uncommon mix of empathy and asperity. Besides the cynical or the lighthearted, which are hallmarks of White’s work, there is a newfound earnestness and gravity in these poems in their survey and interrogation of the human condition. White journeys the span from nursery to hospice—in between, she navigates the prom, family occasions, mating, gossip, and money matters with masterful formal dexterity. This is a collection that rewards the reader with a thoroughly entertaining and illuminating experience. In her remarkable collection, Asperity Street, Gail White takes on the whole sweep of existence. The street becomes the road of a lifetime, beginning with a Southern childhood and ending with a hospice finale. Laconic, ironic and comic, White’s drily resourceful, wickedly companionable voice takes aim on patrimony, matrimony, religion, money and the myth that assumes we choose our lives. With her sublime linguistic choreography, these poems dance to complex metrical tunes. We feel and hear them pulse with equal parts sympathy and vitriol. 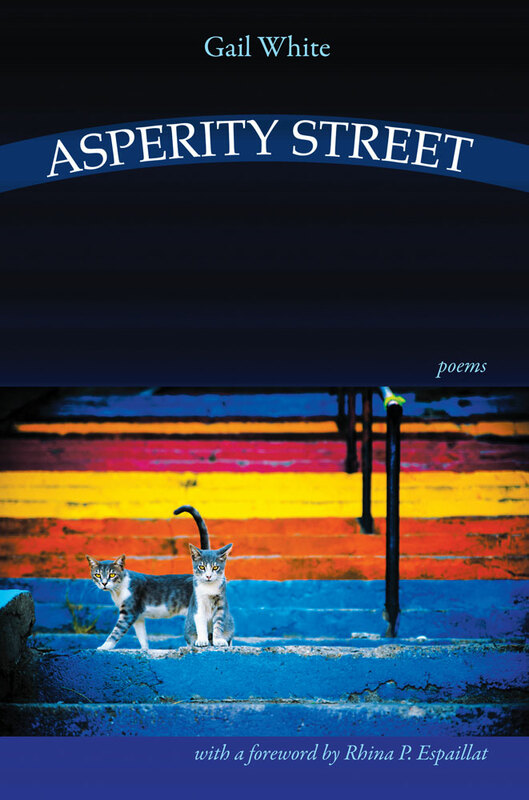 In Gail White’s capable hands, Asperity Street unfolds as a brilliant mural we can return to again and again, as the poet does—still vulnerable, and wiser each time. Gail White has done it again: here is another collection by one of America’s wittiest, most technically adept, funniest and most serious commentators on what it feels like to be human. I looked forward to reading Gail White’s new book of poems, Asperity Street, because I know she is one of America’s funniest poets, so when I got the manuscript I sat down to read it immediately. I knew how much I would enjoy it. I was not disappointed. The first three sections of this four-part collection have wit and bon mots in good measure, socko endings, words I’d never seen in poems before, like “cloaca” or a made-up word ending, “substituth,” to satisfy a droll rhyme. But nothing prepared me for part four. Nothing procedural changed. The insights were as sharp as ever, the language exact and clear, the cleverness and dexterity with form as deft, the music as mesmerizing . . . but this was a serious poet I’d not encountered before: there was a deepening of vision, an enhancement of feeling, the rueful treatment of life and death took on a cutting edge that slices to the bone. Don’t miss reading this book. Gail White has published three previous books of poetry (The Price of Everything, Easy Marks and The Accidental Cynic) and several chapbooks, the latest being Sonnets in a Hostile World. She has edited three anthologies, including coediting The Muse Strikes Back. Gail is widely published and her poetry has appeared in such journals as Measure, Raintown Review, First Things, and Mezzo Cammin, and in anthologies such as Villanelles and Killer Verse, both from Pocket Poets. Gail received the Howard Nemerov Sonnet Award for 2012 and 2013. She lives with her husband and three cats in Breaux Bridge, Louisiana. Asperity Steet is a special honoree in the 2014 Able Muse Book Award.